[Editor's note]: Andy broke this record again in August of 2012, taking an additional 4 minutes off the time. You can read his account of that run here. At some level, it is possible to claim that every race is equally difficult. After all, every race is run to exhaustion. 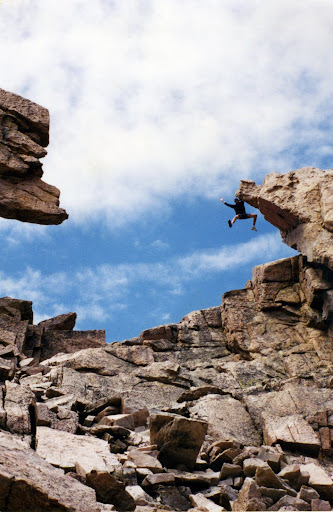 However, imagine that the effort you were about to undertake was an all-out run up and down the highest mountain in Rocky Mountain National Park. Not only that, the race would involve scrambling up 5.4 grade climbing with thousands of feet of direct exposure. Finally, the race would take approximately the same amount of time as a world-class marathon. Such an attempt might make you think that indeed some races are harder than others. Before we get to the interview, you should know that Andy Anderson was my first running partner, and he's such a close friend that I count him practically as a brother. Though our friendship goes far beyond running, it always comes back to it. We ran and raced together in high school in Chattanooga, then ended up on the team together at Williams College as well. We've run in many places: off an interstate on a moonlit night in the middle of Wyoming, on the Hood to Coast relay (Andy took the infamous first leg), up Mt. Greylock in Massachusetts, across both rims of the Grand Canyon, and through the deserts of Southern Utah. I did the hardest workout of my life with him: 10 times up a hill on the trails behind my house in Signal Mountain, Tennessee. Obviously, this effort was more challenging than those 10 hills. (That Andy claims that they were harder than this speed record tells you a little about Andy.) He has been kind enough to answer a few questions about the race, how to train for something like this, and his general approach towards running in the outdoors. Enjoy! LLD: I believe I was with you the first time either of us had seen Longs Peak. We were 14 years old, a couple of Tennessee boys our first time out West with our cross-country coach Larry Hale. Why did you choose Long's Peak for this attempt? AA: If I remember right, our view of Longs was from a hotel room across the valley where we were both lying sick in bed racing each other to the bathroom every so often. 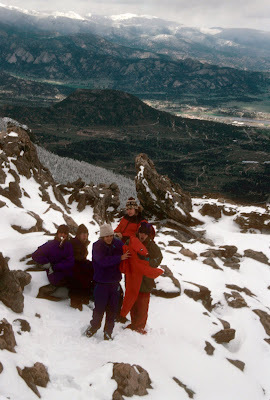 We had contracted some sort of godawful stomach bug, and we didn't get to climb Longs Peak that trip; it would have to wait for another day. The second time we tried to climb Longs Peak was four years later, just after our high school graduation in June. It snowed a few feet on the mountain that day. Even though we did not get to climb Longs, we did have the best snowball fight in the history of teenage boys on the top of Twin Sisters, a neighboring peak. Why Longs you ask? I have always liked running through the mountains, and I love combining running and climbing. Since I started working as a climbing ranger in Rocky Mountain National Park four summers ago, I have thought that it would be fun to try to run up the North Face of Longs. I knew the record was from 1979, and I knew some folks who had tried to break it unsuccessfully. It seemed like this summer was a good time to see if I could come close to the '79 record. LLD: Can you tell us a little bit about the history of the speed record on Longs? AA: Chris Reveley set the previous record of 2:04:30 in 1979. Before him Roger Briggs held the record of 2:09. Each of these gentlemen have a long and storied history with Longs Peak as technical climbers and runners. Chris worked as a climbing ranger on Longs for 4 years before he set the record. The same year he set the speed record he also won the Pikes Peak Marathon. Roger has probably been up Longs by more different routes than any other person, and he pioneered many of the routes on the Diamond. He coached a cross country team in Boulder for many years. Both of these guys still climb and run on Longs. LLD: I imagine there are many ways to get to the top of the peak. How did you plan your route? Obviously the peak is the turn-around, but where do you start? How many miles is the route? What's the vertical gain? AA: The Longs Peak Trailhead at 9450 ft is the start. The routes to the top vary from a 3rd class scramble to 5.13 alpine routes on the Diamond. The North Face represents the shortest way to the top. I used this route for my run. The route has about 200 ft of 5.4 climbing on it. This section of the climb hangs on the north edge of the Diamond. Looking out over this wall you get to see down a few thousand feet to Chasm Lake. It feels like you are climbing through the sky. The technical climbing starts at about 13,400 ft. To get there I pieced together old trails below treeline and scree fields above treeline into the straightest, most runnable, route for me. The terrain has so many options that everyone who tries this run choses a different route that plays to their strengths. Both Chris and Roger used different routes than I did. I found my route through experimenting with various ways up to the base of the North Face over the last 4 years. All in all, the route I used gained about 4800 ft over the course of about 4.5 miles one way. LLD: Did you worry about falling off the mountain? AA: Someone once told me you can't fall off a mountain. 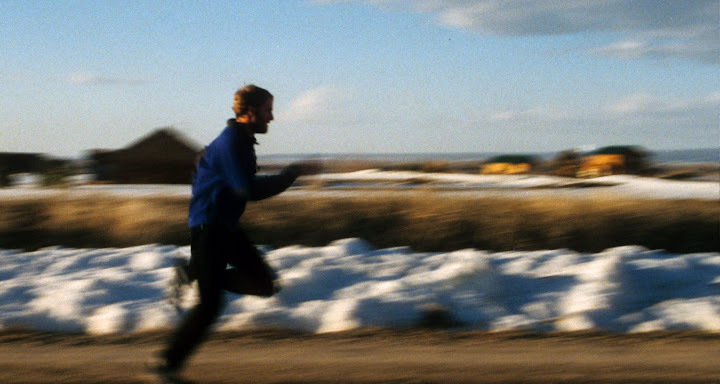 LLD: For a successful ultrarunner, I know you don't run a ton of miles. What's your training like? Do you have a training philosophy? For work I hike, climb, and ski up and down big mountains 10 months of the year. While I am working, I feel lucky to get 30-50 miles of running in a week. The added time on my feet climbing, hiking, and skiing seems to keep my endurance intact. Speed – well that's another matter. I can do ok in longer, slower races over challenging terrain. I get worked in the shorter or more even terrain races where speed starts to matter. I tried to change my training this summer to actually get more miles in. I ran five miles to and from work, then ran 15-30 miles on my three days off. This schedule allowed me to get in 45-70 miles a week plus the time spent on my feet at work. Train enough to be faster than Jeff. LLD: Did you carry anything or just go? Were you supported in any way? AA: I carried a handheld waterbottle with a caffeinated Clif Shot dissolved in the water. I did not have any outside support. I did have a deadline to be back at home before 9am so that I could watch my son Huck and my wife Rebecca could get to work. LLD: Do you think you could beat me in a 50k? 5k? Marathon? AA: HA! See my training philosophy. LLD: You've got a pretty nice resume on the trails (Winner of Rucky Chucky 50k, Woodside 50k, Pacifica 50k (CR), Muir Woods Marathon (CR), Timberline Marathon (CR), 13th at Way Too Cool 50k, 6th and 3rd in Stumpjump 50k, 8th and 5th at Zane Grey 50 miler). How did this compare with other really hard efforts you’ve had? 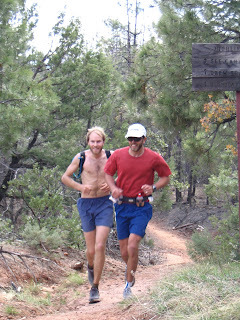 Andy and brother John in the Zane Grey 50m. AA: Running up Longs Peak doesn't really compare to racing in organized events. No aid stations, no official course, no hordes of cheering fans, no other racers. I could only imagine chasing the others who had tried to get this record or imagine the ghosts of Chris or Roger springing from boulder to boulder just ahead of me. An event like this forces me to stay focused for the entire run. If I get distracted, I slow down or I fall. In other hard races I could “get into a groove” or lock onto someone else or focus on the mole on the back of my brother's leg and keep running a decent pace without having to concentrate on my running. As far as the physical effort, I just as tired after this run as I am after other two hour races. LLD: How long before someone else comes along and breaks your record? LLD: What's next for you? I get to be a stay at home Dad till I start work for the avalanche center in November. Hopefully I will get to run a lot this fall and get some speed back. I am planning on running the Stumpjump 50k on October 1st and the California International Marathon this December. Great interview, Jeff; thanks! And big congrats, Andy! You Anderson boys have always been great role models for (slightly) younger, less-experienced runners like me. this is epic - not in a big global epic way but in a tight, human omg-can-someone-really-do-that way. i love how the deadline was set by a personal commitment to be home on time. that is simply perfect. "how could you run up and down that challenging mountain so fast?" "well, i had to be home, see...."
great interview. thanks, both you guys, for sharing and putting this together. First off, thanks to Andy for doing this. He really did it as a favor to me, since his default mode is definitely not "let me talk about my accomplishments." Ace and Jimmy, thanks as always for the comments. Jimmy--I believe I am going to be racing at the UTC XC meet on Oct. 14 in Chattanooga. Thought maybe you'd be there. It would be fun to catch up. What a wonderful interview! So proud of both of you. An awesome accomplishment and an awesome life you both are living.